In the late 90s, one company changed its name five times before they settled on one which today is a well-known brand. The business started as Silver Computing in 1995, then Stellar Computing in June 1997. Six months later, the company would rebrand as next ActiveTouch Systems, then six months later to ActiveTouch Inc., and finally, six months before IPO to WebEx. 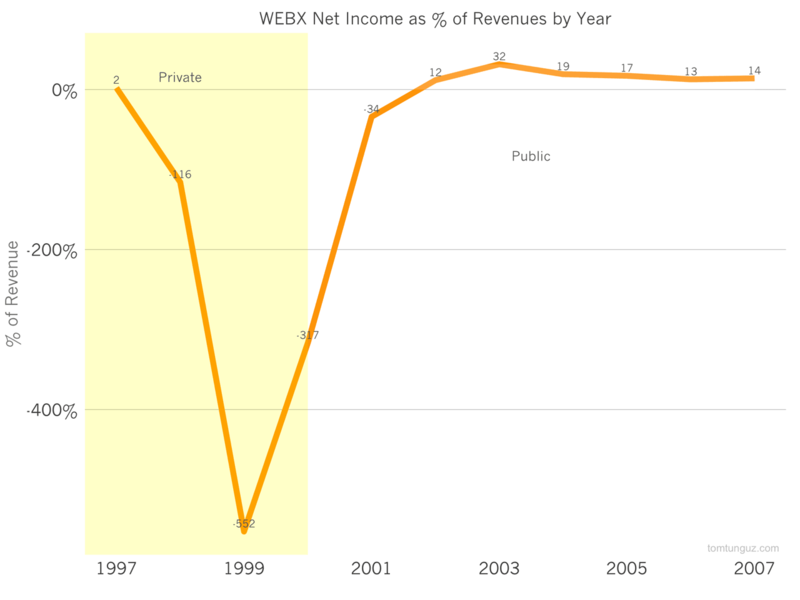 WebEx went public in June 2000 with $8.3M in revenue over the previous twelve months. After three relatively slow years, growing from $1M to $3M, the company’s revenue rocketed 7x, then 3x and the close to 2x, as the chart above shows. And churn was pretty impressive, too. 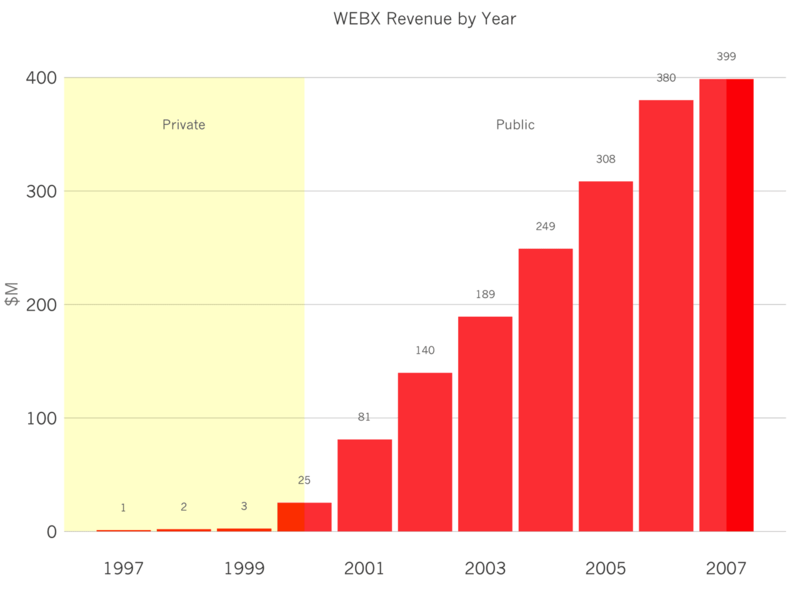 WebEx retained 95% of their customers the year they went public. To achieve that phenomenal growth in 2000, the company ramped their sales and marketing investment from $2M to $9.3M to $50M from 1998 to 2000, representing an astounding 300%+ of revenue. After the dot-com crash, the company stabilized their investment in sales and marketing constant at $50M, which was roughly 40% of revenues. The executive team sustained that level for eight years, until their acquisition by Cisco for $3.2B. WebEx benefitted from an extremely efficient sales model. Setting aside 1999, the company enjoyed sales efficiency of greater than 1 until the business attained $150M+ in revenue. 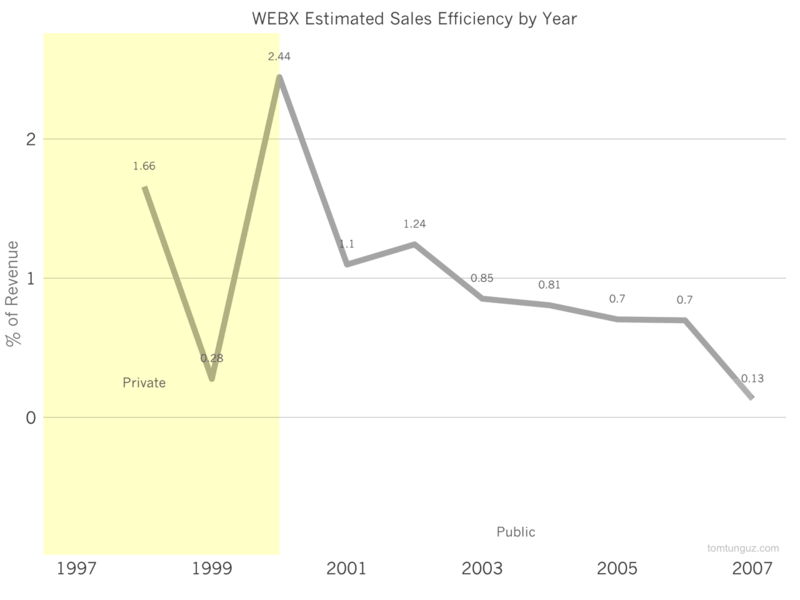 As we’ve seen in the other S-1 analyses, most companies never observe sales efficiencies better than about 1.1, for the two years before IPO and subsequently, which makes WebEx’s model that much more impressive at scale. The combination of the company’s revenue retention and sales efficicency suggest the massive investments in sales and marketing were substantiated by strong unit economics. This dramatic sales and marketing investment generated an $80M loss in 2000, but two years later, astoundingly, the company generated $16.4M in profit, or about 12% of revenues. This ability to transform from burning huge amounts of cash, to attaining both cash flow break-even and profitability, all the while growing more than 30% per year is due in large part to the unit economics of the business. From then on the company remained profitable. At the company’s spending peak, the company burned $3.75M per month. In total, the company consumed about $65M to reach cash flow break-even and profitability, having raised about $110M before a $40M IPO. 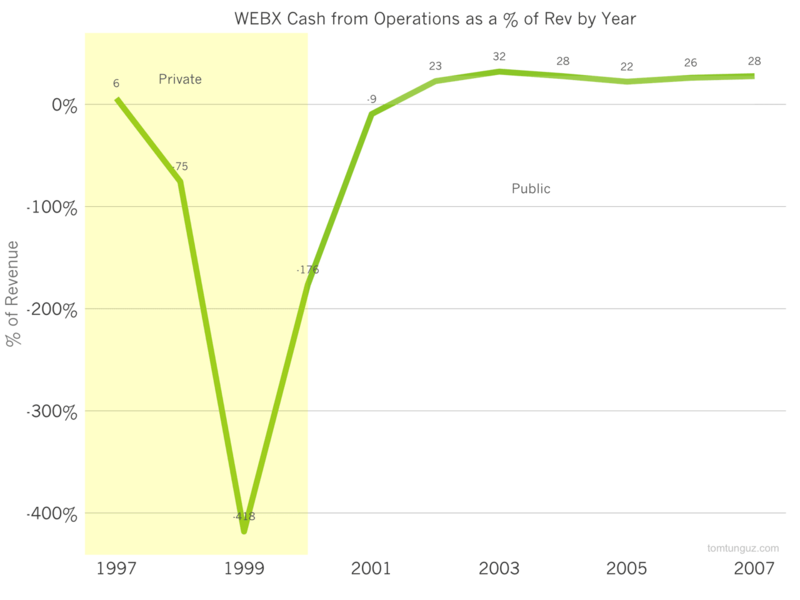 WebEx’s story is an important one particularly today, given the state of the fundraising markets for startups. 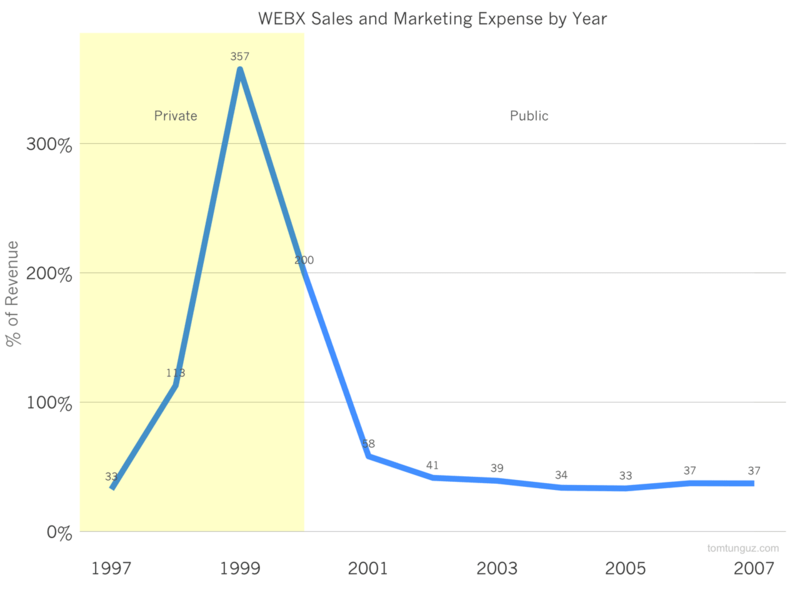 Despite the collapse of the stock market the disappearance of many startups/customers, and the tremendous burn rate of the business, WebEx grew steadily and consistently. The history of WebEx exemplifies the importance of operating a business with sound principles and decision-making. Great customer retention and superb sales efficiency are a winning combination. If a business has great economics, no matter the disasters and turmoil in the external environment, the company can be worth billions and grow throughout a down-cycle.